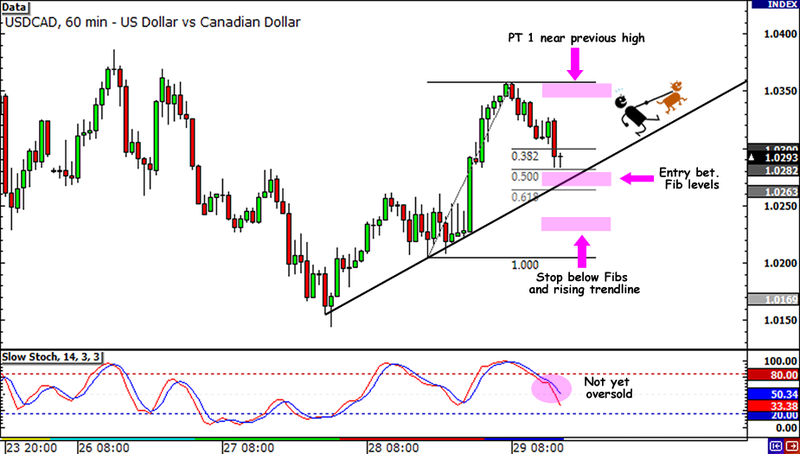 USD/CAD Trend Line Play: 120-pip WIN!!! Yipee! Finally a win for me! My long USD/CAD trade worked like a charm and I was able to bag 120 pips on the trade. But there’s still a lot of improvement so I decided to figure out how I could’ve played this trade better. For one thing, I should’ve been more patient and waited for the price to hit my original entry order at 1.0270. That would’ve been an additional 30 pips! Instead, what happened was that I entered half my position at 1.0300 and planned to enter the rest at 1.0270 if it touches. But, guess what? I didn’t follow my plan again! Bad Happy! Since I was watching the 15-minute chart before setting my order at 1.0270, I got goosebumps from seeing all the red candles and even thought of exiting early. Good thing I didn’t though! Let’s end this week with another win, shall we? 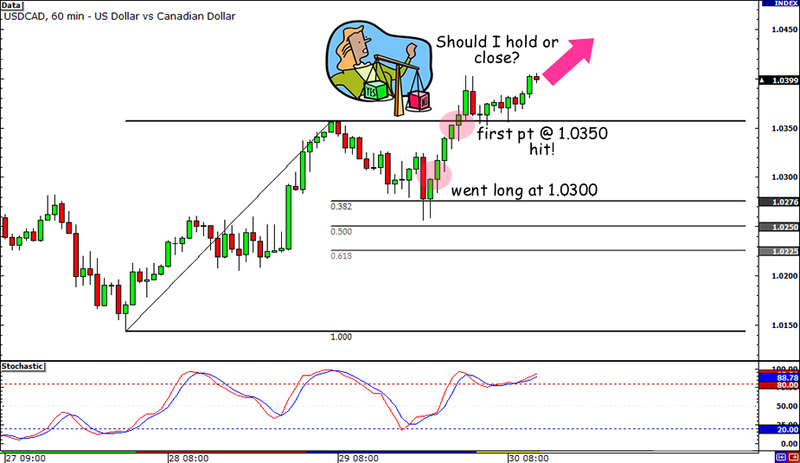 My USD/CAD trade is working like a charm! Mixed economic reports from both Canada and the U.S., a surprising New Zealand credit rating downgrade, and a general case of risk aversion in markets kept USD/CAD supported throughout the day. It even reached 11-month highs yesterday! As I promised though, I only entered the trade manually. Right after I posted the trade I thought that price wouldn’t reach my original entry, so I manually entered at 1.0300 instead of waiting for it to fall to 1.0270. Tsk tsk. Still, I’m now 100 pips up! So what do you think should I do next? I have already moved my stop to break even and now I’m looking to see if I should take profits ahead of the Canadian GDP data at 12:30 pm GMT or simply add to my position and put a tight stop loss. Right now it’s looking good for my trade that USD/CAD is testing the 1.0400 resistance, but I’m also worried that volatility later in the U.S. session could affect my profits. Any tips? Okay, this time I’m gonna try being much more patient and wait for confirmation signals before I jump in a trade. My last AUD/USD parity trade didn’t go so well so instead of setting orders straight away, I’ll wait and see how the markets react to news first. You see, Germany is expected to vote on the EFSF expansion today and this event could be a big market mover. Although the proposal to increase the EFSF beyond 400 billion EUR will most likely get approved, the number of votes cast could be indicative of how the Germans feel about the bailout packages. Analysts say that anything less than a “Chancellor’s Majority” or 311 votes would undermine confidence in German Chancellor Merkel’s leadership and could influence future government decisions. With that, I’ll be sure to keep my eyes and ears peeled for any updates starting 11:00 pm GMT. As for Uncle Sam, another round of weak economic figures is expected. Today, they will release the weekly jobless claims and pending home sales. Poor employment and housing figures could spur risk aversion, which could boost USD/CAD. As I was looking for a good level to buy USD/CAD, I noticed that there was a rising trend line connecting the lows of the price on the 1-hour chart. The pair just bounced from that trend line but it looks ready to retrace, possibly around the 38.2% Fib close to the week open price. If I decide to go long, I’ll buy at the 1.0270 mark, which is also near an area of interest. I’ll set my stop below the 61.8% Fib to give the trade enough breathing room. If it goes my way, I’ll aim for the recent highs around 1.0350. 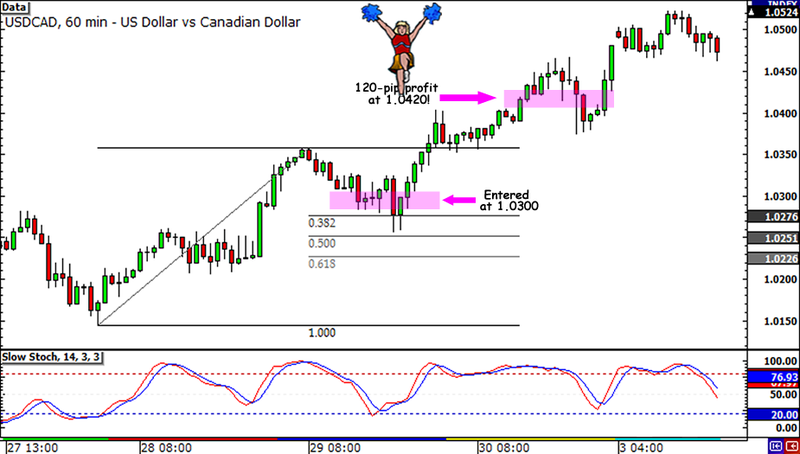 Long USD/CAD at 1.0270, stop at 1.0220, PT1 at 1.0350. I’ll be risking 0.5% of my account on this trade and keeping a close eye on reports to see if I should exit early. Do you think I can finally score a win with this one? Hit me up through any of these!